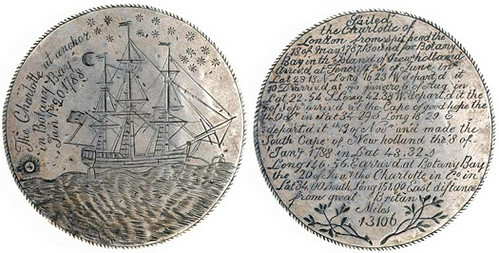 The Charlotte medal in silver is believed to have been engraved on board the First Fleet transport Charlotte as she lay at anchor in Botany Bay before sailing into Port Jackson and unloading her cargo of convicts at Sydney Cove on 26 January 1788. Inscribed with an account of the voyage from England and an image of the Charlotte, it is acclaimed as Australia’s first colonial work of art, and furthermore, as a unique record of the arrival of the settlers who founded modern Australia. 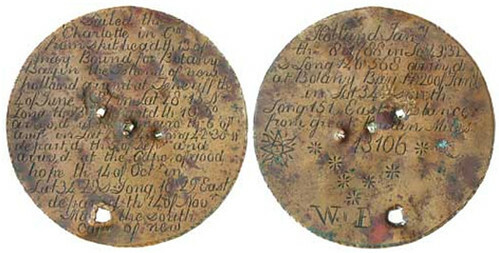 The 74mm wide medal is believed to have been made from a surgical dish by convicted thief Thomas Barrett at the behest of John White, the ship’s surgeon. White wanted a memento of the historic landing and chose Barrett for the task after he’d displayed remarkable skill at forging coins during the arduous sea voyage. Alas, Barrett lasted little more than a month in the convict colony, meeting his fate at the end of a hangman’s rope for stealing beef and peas. Not only was he responsible for the historic silver medal, but also a smaller copper version, thought to have been commissioned by White’s personal servant, William Broughton. Material for the second medal could have come from copper sheathing used to protect the ship’s hull. The finished piece measured 47mm in diameter and featured an abridged form of the inscription on the silver medal, but no ship. Sailed the Charlotte of London from spit head the 13 of May 1787. Bound for Botany Bay in the Island of new holland Arriv’d at Teneriff the 4th June in Lat 28.13N Long 16.23 W depart’d it 10 Dec arriv’d at rio janeiro 6 of Aug in Lat 22.54 S Long 42.38 W depart’d it the 5 of Sept arriv’d at the Cape of good hope the 14 Octr in Lat 34.29 S Lon S 18.29 E depart’d it th 13 of Nov and made the South Cape of New Holland the ‘8 of Jany 1788 in Lat 43.32 S Long 146.56E arrived Botany Bay the 20 of Jany the Charlotte in Co in Lat 34.00 South Long 151.00 East distance from Great Britain miles 13106. The silver Charlotte medal belonging to surgeon John White, who returned to England, remained unknown until it appeared in the famous collection of the Marquess of Milford Haven. Details were published in 1919 in the first volume covering his collection of naval medals. William Broughton remained in the colony, rising to become an official of significant stature in the Government of New South Wales. His copper Charlotte medal was discovered during the 1940s on the site of a farm in Camden with which he was associated.